Muffler Case Length: 24 in. Muffler inlet Diameter: 3.00 in. Muffler Outlet Diameter: 3.00 in. Muffler Overall Length: 30 in. Many industry experts agree that Gibson Performance is the top manufacturer of high-performance and street-legal exhaust systems for gasoline and diesel trucks, SUVs, and American muscle cars. Whether you are driving on the street or off-road, you can count on Gibson’s lineup of performance mufflers, exhaust tips, and headers to squeeze out more power from your petrol or diesel-powered truck or SUV. Gibson Performance was founded by Rob Gibson and quickly became known as the most cost-effective high-performance exhaust system that money can buy. It all started with a passion for adding more power and torque in recreational vehicles or RVs. Gibson began to develop exhaust systems that allows the engine to breathe better and run cooler without adding too much exhaust noise or that annoying ‘drone’ inside the cabin. All Gibson headers and exhausts are 50-state legal and will not void the factory warranty of your vehicle. The products are manufactured from the highest-quality stainless or aluminized steel to ensure the highest level of quality and engine performance. The nice thing about Gibson is all their products are easy to install and are designed according to the factory OEM specs. This results in a clean and simple bolt-on installation without the usual cutting or welding compared to other aftermarket exhaust systems. When choosing a quality set of exhausts for your truck or muscle car, it is important to know the distinction between an axle-back and cat-back exhaust. The axle-back is more economical since it only involves replacing the factory mufflers and exhaust tips in your ride. Cat-backs are designed to bolt after the catalytic converters of your vehicle and are more costly to purchase. Sam’s Motorsports offers a significant array of Gibson exhaust systems, headers, mufflers, and exhaust tips for all types of pickup trucks, sport utility vehicles, and American muscle cars at the most competitive prices. 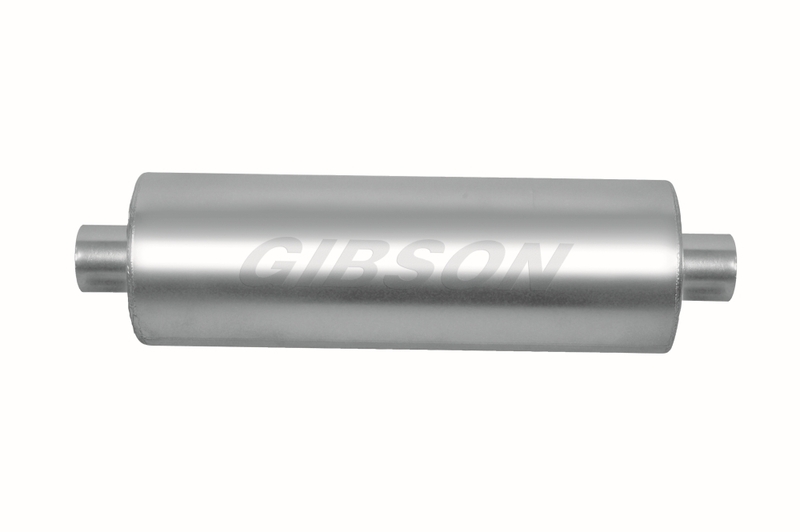 While this Gibson SFT SuperFlow Round Exhaust Mufflers might fit your vehicle, unfortunately we can't guarantee fitment. Please read description and specifications to decide if this part is right for your vehicle.